The home hot air fryers range in prices from just under $100 to below $400. These air frying machines do not come cheap. Cooking with an air fryer should mean more than just cooking French fries to justify its not so cheap price. You will not be disappointed with the highly versatile hot air deep fryer and its healthy cooking modes. The hot air fryer claims to be able to fry, roast, grill and bake. That means you can cook a lot of foodstuff in the hot air cooker. This makes it a highly versatile cooking appliance. Whether frozen food or raw meat or reheating leftover food, the hot air multi-cooker does a great job. All frozen foodstuff meant for baking in the oven cooks perfect in the hot air food fryer. Frozen fries, nuggets, fish sticks etc. cook faster in the more compact airfryer compared to the bigger size oven. Zero oil frying with the low fat fryer results in less calories compared to those deep fried. French fries being a staple in the American diet, the air fryer does a wonderful job frying French fries. A single layer of Frozen fries take about 12 minutes only to get that crispy outside and moist inside texture. Get ready for dinner with air fried fish and chips in just 15 minutes. Shaking the food halfway during the cooking process ensures more even cooking. Shaking the food also produces more even browning of the cooked food. You can roast chicken or pork in the fryer. A whole chicken will take about 30 minutes at 360 degrees F.
Air fried roast pork has a very crispy skin, oh so delicious. Do check out the video below on roasting pork belly in the air fryer using the cooking basket. 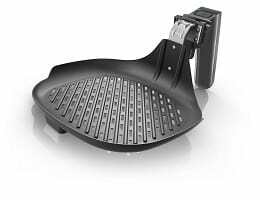 The Philips brand has come out with a grill pan specially for use inside the air fryer. You can grill your homemade meat patties, burgers, steaks, lamb chops,salmon, fish fillets etc. and these cook fast as well as taste great. You can also use it to grill vegetables too. The air fryer with rotisserie can be used to roast a whole chicken rotisserie style. All it takes is just about 30 minutes to cook your delicious moist low fat chicken. The GoWise turbo air fryer 10.5 qt comes with accessories such as rotisserie fork, baking cage and a rack for double layer cooking. You can roast certain types of vegetables in the air fryer. Vegetables that you would normally grilled can be done in the hot air frying machine too. Cauliflower, capsicum etc can be grilled in the machine. The Tefal Actifry can even fry green vegetables just like the way you fry them in the skillet. This is possible due to the round ceramic bowl and stir paddle that comes with the unit. The paddle stirs the food slowly just like the frying ladle. Fresh mushrooms such as portobello, enoki etc turns out crunchy when roasted using this hot air kitchen appliance. The Philips air fryer has an optional buy accessory, the non stick baking dish which is very useful for baking small items such as muffins, custards, bread, lasagna, quiche,or a small cake. Besides baking, you can even use it for cooking casseroles or curries. This means that you can cook anything that comes with a watery sauce. You can’t do that with the mesh wire bottomed cooking basket. This baking dish greatly increases your cooking options with the air fryer. 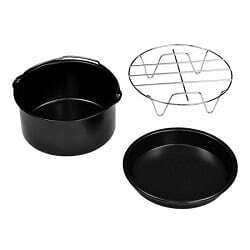 Simple Living Products and Avalon Bay have their own 3 piece air fryer accessory sets that include a baking dish, pizza pan and a layered rack. These are compatible with most air fryers. You can buy the air fryer accessory set that can be used on most standard air fryers. The more accessories available, the wider the varieties of recipes that can be done. 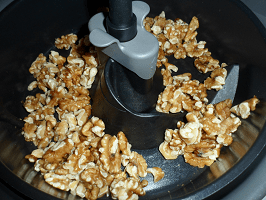 Roasting peanuts, walnuts, almonds or any type of nuts can be easily done in the air fryer. Peanuts and almonds take about 10 minutes and walnuts only 5 – 8 minutes. It is super easy, the nuts do not get burned. I definitely prefer roasting them in the air fryer than in an oven. It’s slightly faster in the fryer too. 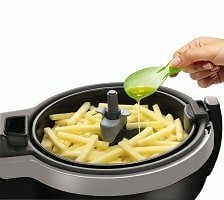 When using the Tefal Actifry with its stirring paddle, you do not have to stop the process halfway to give the pan a shake. Batter-coated food is not so suitable for hot air frying. This is because the fast moving air will push the batter away from the food, causing it to be splattered all over the cooking basket. 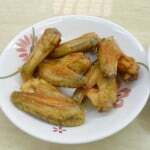 However, there are customers who have done that successfully by first frying the batter-coated chicken pieces in the pan first and then finish frying in the hot air cooker. Some have tried chicken pieces rolled in a thin layer of flour (mix flour with a teaspoon of oil first) followed by breadcrumbs and then straight into the fryer. Mixing the dry flour with a bit of oil makes it easier to stick to the chicken as well as giving the texture a nicer crunch and color. As long as the flour is not too dry or too wet, it is still possible to cook it in the air fryer. Cooking with the air fryer involves a bit of innovation and experimenting with the time as well as the temperature. The size of the food will also affect the cooking time and heat needed. Yes, you can cook practically any foodstuff in the hot air multi cooker, all cooked with zero oil or minimal oil added. Most food can be cooked under 30 minutes. 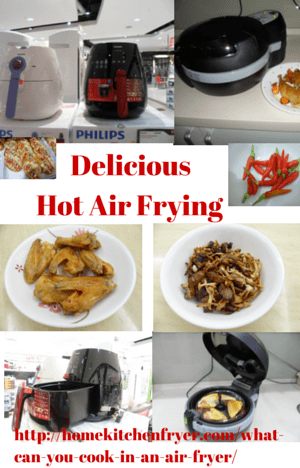 Patience and experimentation are keys to successful hot air frying in the home kitchen air fryer. Your favorite comfort foods, your breakfast, lunch and dinner can all be done in this counter top air fryer. How’s that for versatility and convenience.